What If You Stopped Stressing About Your Body? 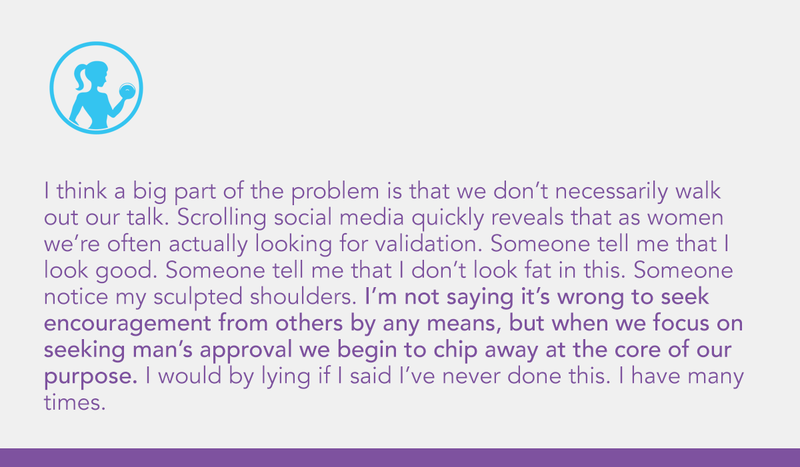 Recently as I worked in a coffee shop while traveling with my husband, I sat near a group of women who continually ridiculed their bodies along with those of acquaintances not at the table. I don’t think they truly understood the power of their words or the fact that it sounded so shallow for an outsider to hear them stress so much about their physical appearance. But I was convicted in the same moment, because I’ve done the same. Many times. I used to stress so much over my body. For years I didn’t nourish it properly and literally ran my tail off. I counted calories, ate sugar free icecream like it was my job (seriously like a gallon per week). Then for years after that I competed in fitness competitions and forced myself to eat nothing but clean food all of the time and ate 5 meals per day no matter how much Tupperware I had to pack when traveling or how much I didn’t even feel like eating another meal. Neither left me happy or fulfilled. EVEN when I had accomplished that “perfect” physique that I’d been waiting for and finally had a rounded booty. I didn’t feel I had arrived, instead I felt the burden of what it would take to maintain. I knew that I obsessed far too much about my body. I knew that I put far too much energy into the way I looked in photos (and that was BEFORE the age of social media), but I didn’t know what to do about it. I knew that it wasn’t healthy to obsess over food when I had great opportunities to travel and do fun things, but I couldn’t break it on my own. I just couldn’t do it! The Lord worked. I can’t say that all of a sudden I didn’t care so much about my appearance, but I can say that he gave me new important responsibilities and roles that required more of my attention. I can’t tell you that I never linger in the mirror nitpicking, but it’s far less often. How did it happen? Slowly. Very slowly. Namely I became a Mom and a business owner. God showed me that my significance was far greater than my physique. I began to recognize that my body didn’t take up so much of my focus anymore. I also began to realize that the less I stressed, the better I felt and the better I felt the more confident I became and with more confidence, I felt more comfortable in my own skin and my own body. It all kind of all happened at once. I have accepted the fact that I don’t have the mental space to design workouts and meals around them to aid in hypertrophy of my glutes in order to shape that rounded booty again. And truthfully I don’t WANT to spend my brain power on my body. But what I can do is practice healthy habits day after day that optimize my health and keep my body strong for the things that I want to accomplish with my life and for taking care of my family. What’s that balance for you? How can you pursue health and feeling well and energized without become obsessive? The truth is, I don’t have the answer for you. What I do know, is that when we focus so much on shallow “wants”, we completely lose sight of God’s best for us. Do not hear me the wrong way. I am NOT saying that you shouldn’t pursue health. Yes, we need to take care of our bodies. Yes, we need the stress relief. Yes, we need a few minutes to ourselves. We’ve got to value ourselves to make those changes worthwhile because, newsflash, they take energy. SO, let’s take all of that energy we’ve been spending obsessing and shaming ourselves and put it to work. Pray First. Act Second. Evaluate third. God’s got you and He’s got this. I would love to hear from you. What’s your struggle? What’s your hang up? Where do you need prayer?